The saphenous nerve leaves the femoral nerve in the upper third of the thigh and passes down the thigh with the superficial femoral artery between the vastus medialis and adductors. In the mid to lower third of the thigh the Sartorius muscle crosses over the nerve and vasoadductor membrane forming the adductor canal. The distal end of the canal lies between 7 and 11 cm above the patella1. The femoral artery then dives deeper to pass through the adductor canal to the popliteal fossa as the popliteal artery whilst the saphenous nerve passes between Sartorius and Gracilis muscles accompanied by the saphenous branch of the descending geniculate artery (SBDGA) to lie alongside the saphenous vein in the lower leg. The saphenous nerve is sensory to the skin on the medial side of the leg to the medial malleolus. Lopez et al 2 demonstrated its distal extent rarely exceeds the mid foot, and is not necessary for bunion surgery. After dissection of 52 cadavers, Eglitis et al 3 found deep branches of the saphenous nerve innervate the periosteum of the distal tibia and talocrural capsule. Onset times for blocks which penetrate the paraneural sheath are faster (15 vs 23 min) and more successful than those placed outside the sheath. The sciatic nerve is most easily seen lower in the popliteal fossa after it has split into tibial and peroneal nerves. Here it is in its most superficial position, usually in the middle of the popliteal fossa superficial (posterior) to the popliteal vein and artery. Lateral to the nerves lies the biceps femoris (BF) muscle and medially are semitendinosis (ST) and semimembranosis (SM). As the nerve is traced proximally, the two branches merge to form the sciatic nerve and the nerve becomes more deeply placed beneath the BF muscle. 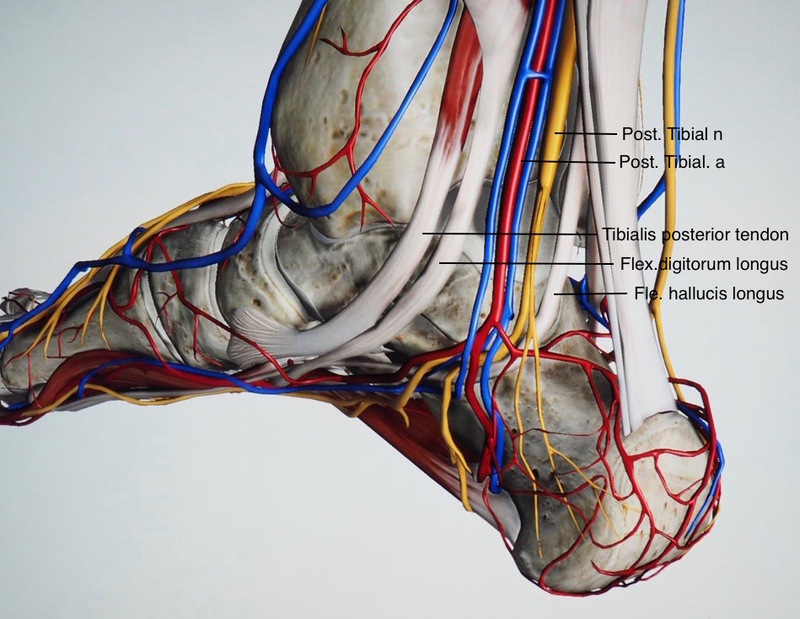 5 nerves provide the neural supply to the ankle. It is not necessary to block all five for all cases but several injections are usually required which may be painful. Give fentanyl +/- midazolam before the block. This nerve supplies the plantar surface of the foot via the medial and lateral plantar nerves. 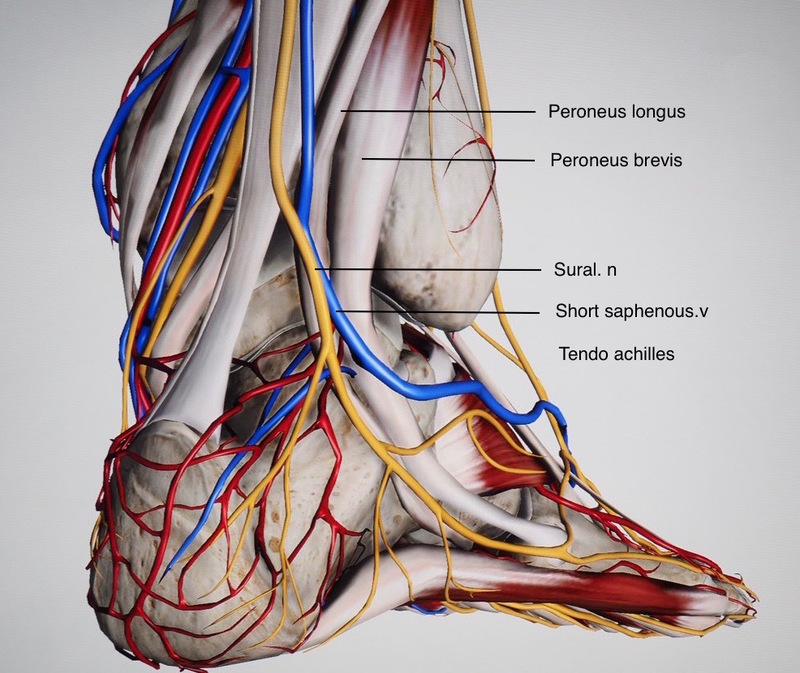 The lateral border of the heel is suppliesd by the sural nerve. It can be found behind the medial malleolus lying posterior to the post tibial artery and then the probe is moved proximally 10cm where it remains lateral to the PT artery and its accompanying veins, and between the flexor digitorum longus and soleus muscles. This allows the probe to rest nicely on the skin without probe artefact. Using an in-pane or out of plane technique 5 mls of LA is injected around the nerve. As this is the largest of the nerves to be blocked it is best blocked first to allow time for block onset. May be blocked in the adductor canal, or below the knee adjacenet to the long saphenous vein. Variable supply of the medial side of the ankle but never distal to the mid foot. Required in only 4% of foot surgery. Scan over the anterior-lateral aspect of the tibia and identify the saphenous vein. The nerve usually lies on the lateral side of the vein. If the nerve can’t be identified inject 2-3 ml LA around the vein. This nerve supplies the dorsum of the foot from the great toe to fourth toe excluding the first webspace. Scan lower fibula then move and identify the Extensor Digitorum longus m. (EDL) anteriorly and Peroneus brevis m. posteriorly with peroneus longus tendon overlying it. As the probe moves up the leg from the ankle the fibula becomes deeper and the muscle bellies oppose each other. 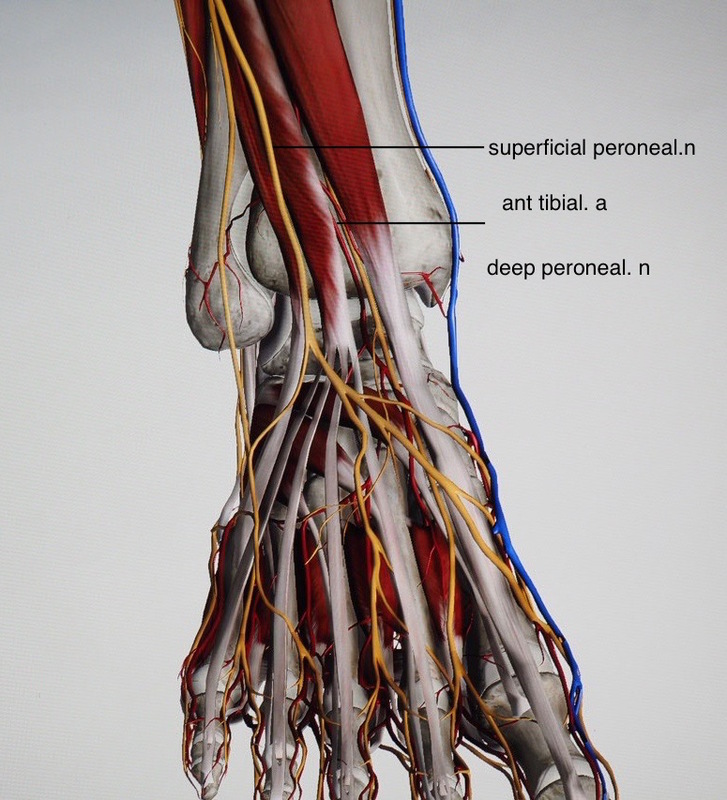 The superficial peroneal nerve lies superficially between these two muscles distally and it dives under the fascia and deeper as it ascends the leg, now lying between EDL and peroneus longus muscle. It is easily blocked using an in-plane technique with 2 -5ml LA. Supplies the first webspace on the dorsum of the foot. Trace the probe proximally from the anterior surface of the tibia. Identify the anterior tibial artery and veins. The DPN is usually lateral to the artery and more proximally is anterior then lateral again. As the probe is moved from proximal to distal the nerve can be seen moving from lateral to anterior to lateral of the artery. Using an In plane approach from the lateral side of the probe inject 2-4 ml around nerve. Supplies the lateral posterior calf and lateral boder of the foot. Start over the fibula and scan posteriorly over peroneus brevis toward the Achilles tendon . Between these the short saphenous vein can be identified with the nerve lying deep and posterior to it. As the probe is moved proximally the nerve will come to lie anterior to the Achilles tendon. Place LA 2-3ml around nerve. - Catheter insertion 5cm proximal to the bifurcation provides superior postoperative analgesia in marked contrast with single-injection popliteal sciatic nerve blocks where distal is better than proximal. - Ultrasound guided ankle block is highly effective for bunion surgery. The sensory territory of the saphenous nerve seems to only extend to the midfoot. 97% of patients for bunion surgery would not benefit from a Saphenous n block.